Born in Bath, Sasha Harding grew up by the sea on the south coast in Dorset. Her contemporary paintings are inspired by her happy childhood spent on the coast of Dorset. She continues to live close to the coast and finds on going inspiration from the seashore and local life. Sasha Harding uses a selective palette which reflects the gentle, natural colours of the seashore. She uses clean lines and clear images to depict coastal scenes. 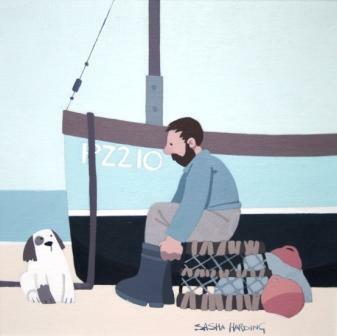 ''Boots On, Ready for Work'' shows Harding''s sense of humour which sparkles irrepressibly through the painting of the fisherman and his dog. Sasha Harding lists many influences on her art works including the Scottish colourists, Newlyn artists and Stanhope Forbes and Elizabeth Forbes. In addition to Red Rag Modern Art Gallery Sasha Harding has exhibited at other leading British Art Galleries. Each painting at Red Rag is sourced from the Sasha Harding artist studio and like all Red Rag British art and Modern art it can be shipped worldwide. Click here to view more contemporary paintings by Sasha HARDING.